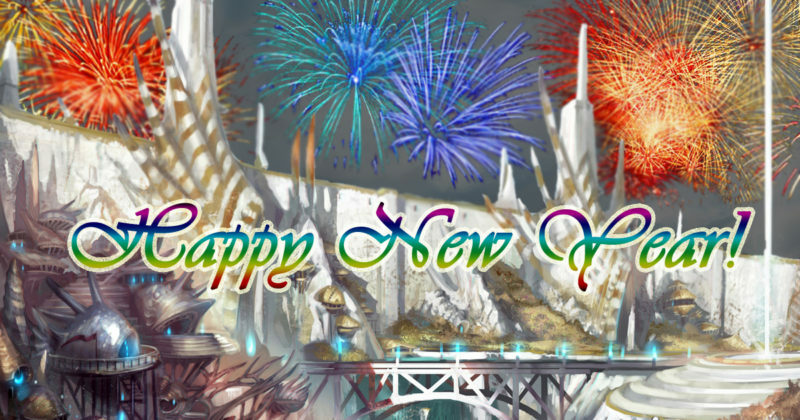 Rather than a typical year in review, the Producer of Lusternia shared the trials and tribulations that Lusternia faced in 2018, including a candid look at the reduced player base. However, no one is giving up on Lusternia, the staff remains, and the future holds many big changes, including a look at the economy and the ability to earn free daily credits. Read more! For full transparency, Lusternia released a timeline of what to expect in the upcoming first quarter in the economy, the change to daily credits, Ascension and more. Read more. The conclusion of the ongoing Saga of the Kaelye saw an end to the strange occurrences that plagued the Basin of Life throughout the year and the birth of a new aetherbubble. After the kaelye left the Basin of Life and returned to their homeland, alarming phenomena began to occur at an increased pace, including bouts of vertigo, changes in gravity and earthquakes. The Nexus Keepers, who were in intense pain, held a conclave to determine just what was happening. Unfortunately, old feuds were not so easily dismissed, and the conclave had trouble staying together. Read more! As mysterious catastrophes continued to devastate the Basin of Life, the sound of shattering glass led to the discovery of a gnomish connection. Could the criminal organization known as the Gnafia be behind the exploitation of an interdimensional incident? Read more! The Nine Seals holding the Soulless Gods began to weaken as the result of planar dimensions colliding with each other. Clues led back to the kaelye. Was the homeworld of the kaelye out of phase with the rest of reality trying to physically merge with the Basin of Life? And what role did Queenie of the Gnafia play in this tragedy? Read more! It was discovered that Professor von Fixit, a gnome aboard the aethership known as the Starhopper, held Gnafia schematics for a device that could actually move aetherbubbles. But first Queenie had to be confronted which led to a wild and bloody confrontation. Read more! The device capable of moving aetherbubbles was pulling the hidden aetherbubble known as Lyraa Ey Rielys, homeworld to the kaelye, directly towards the Facility, homeworld of the gnomes. In order to save both the gnomes and the kaelye, a daring attempt to seize control of the device led to the final conclusion of the Saga of the Kaelye. Read more! January 1-31: For the month of January, you can purchase artifacts directly on the website, including special edition artifacts only available through the artifact cart! Presents are also available on the website for direct purchase. Artifact Cart and presents are both available on the Credit Page! Also you can purchase New Years resolutions during January (see RESOLUTIONS in-game).